As you can see, this week coming up is going to be a busy one for us at the Uptown. Not only do we have our second busiest day of the year, Valentine's Day, the beginning of Lent falls on this week as well. As you read above, our traditional Lent specials will begin on Ash Wednesday and will follow every Friday through Lent. What else can happen this week? Well we cannot forget about Fat Tuesday and Mardi Gras. With so much to offer next week, we hope you do not miss out on these seasonal specials we have put together. Fat Tuesday is normally what most people think of as the end of Mardi Gras. However, quite literally, Mardi Gras means Fat Tuesday and refers to the last day of the Carnival season. Although activities are a bit different around the world, one thing remains the same: it is the last day of eating basically whatever you want because there will be no more rich, fatty foods during the fasting of the Lenten season. All 47 days of it! What other way to pig out than with a few Southern style dishes that are true to Mardi Gras cuisine? We will be offering a few of these favorites on Fat Tuesday. This is a classic Cajun communal stew that is the best thing to come out of Louisiana. There are as many gumbo recipes as there are cooks in New Orleans. Come see what Chef Chris has put together. Etouffe is another traditional Cajun and creole cuisine that uses a cooking technique of smothering the dish and serving over rice. We take a 10 ounce orange roughy filet, broil it and smother in our housemade etouffee sauce. It is served over long grain wild rice. 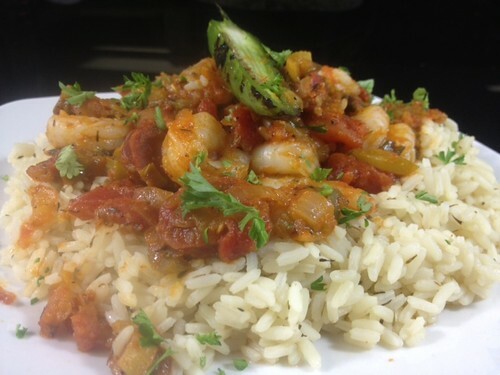 This is a traditional Cajun recipe of sauteed shrimp, andouille sausage and thyme with a trinity of onions, peppers, celery and tomatoes. It will be served over white rice.